Harrison Jacobs/Business InsiderCornell Tech grad students John Quinn, Noshin Nisa, Kiyan Rajabi, and Carolina Peisch talk before their Startup Studio class. The Studio Program, the school’s core curriculum, helps students build a company from conception to prototype. 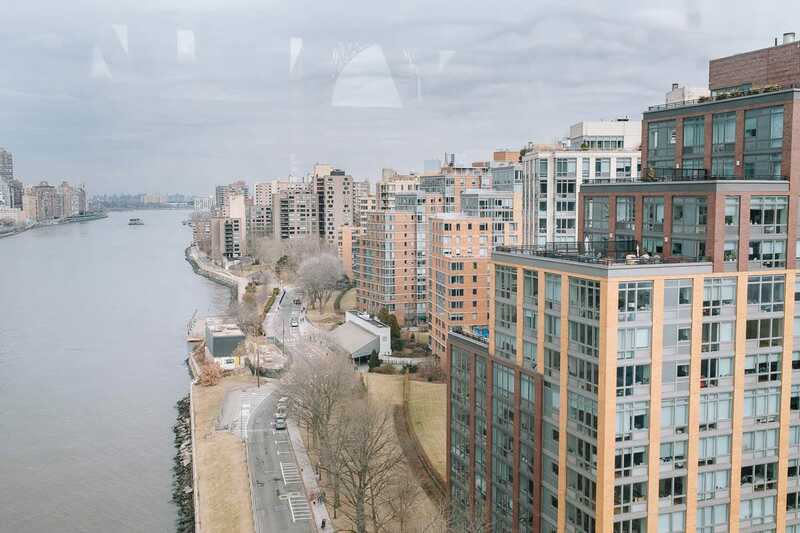 Over Cornell Tech’s six-year history, 40 startups have raised around $US32 million in funding. 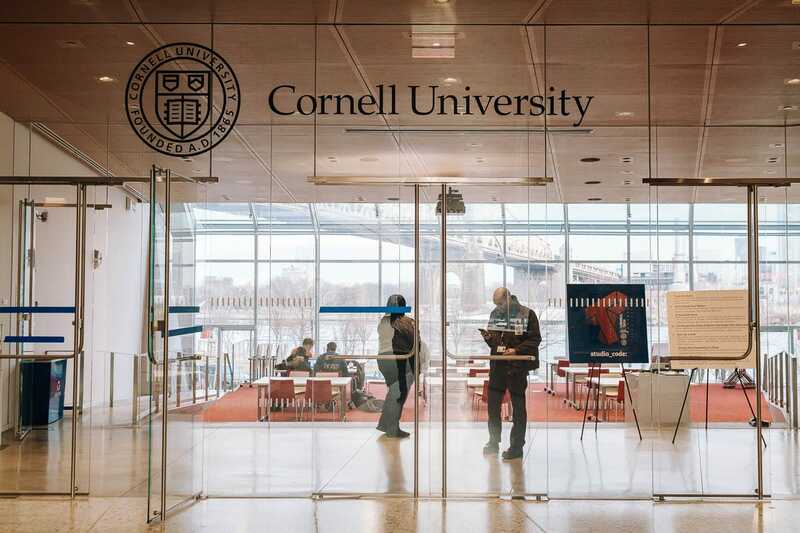 “We are definitely not the startup school,” Daniel Huttenlocher, the dean of Cornell Tech, said to me recently. One might be forgiven for thinking so. Bloomberg aimed to expand the city’s growing Silicon Alley scene and develop the kind of virtuous cycle that exists between Stanford University and Silicon Valley. His administration estimated that the school would generate $US23 billion in economic activity, 8,000 permanent jobs, and hundreds of new companies over the next several decades. The school, now in its sixth year,is a new kind of graduate school – multidisciplinary, hands-on, and explicitly tech-focused – that is still building its reputation. While it teaches a combination of graduate course heavyweights – business, computer science, law, and electrical engineering, among them – it also has newly-invented disciplines. Connective media, for example, aims to combine computer science with sociology and psychology to create “human-centric” engineers. Like all startups, it’s nothing if not ambitious. 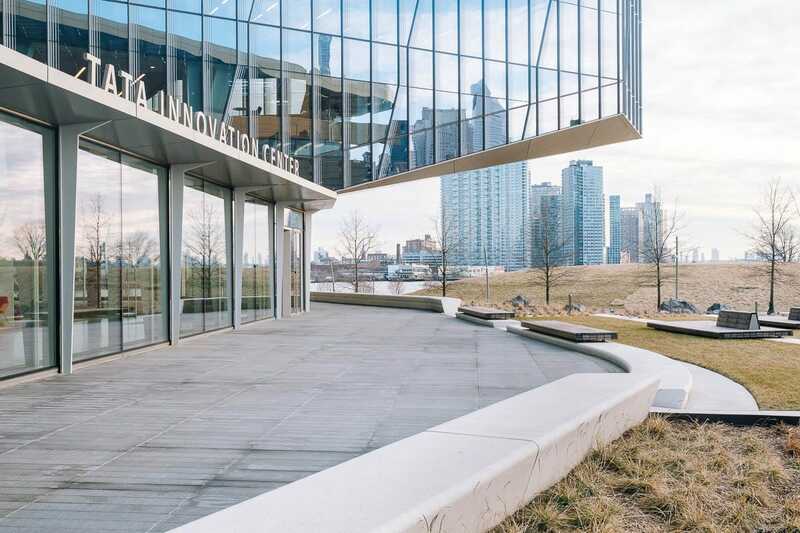 For Cornell Tech, that future is dependent on bringing its vision of world-leading research on digital technology andinnovative, impactful companies to fruition. Cornell Tech moved to its permanent location last year, a newly constructed campus on New York’s Roosevelt Island. Prior, the school was housed in a temporary space in the Google Building in Manhattan’s Chelsea neighbourhood. Harrison Jacobs/Business InsiderA view of Roosevelt Island from the aerial tramway that connects the island with Manhattan. 2. Its master’s programs must produce graduates that get excellent tech industry jobs or produce innovative companies. The Emma and Georgina Bloomberg Center, named after former mayor Michael Bloomberg’s daughters, is the centrepiece of campus. It aims to produce as much energy as it consumes, housing more than 1,400 solar panels on its roof. Harrison Jacobs/Business InsiderThe Emma and Georgina Bloomberg Center was developed from a $US100 million gift from former mayor Michael Bloomberg and designed by Morphosis Architects. The Bloomberg Center is the school’s primary academic building. Its sleek minimalistic aesthetic, casual huddle spaces, and colourful meeting rooms evoke the offices of Silicon Valley tech companies. 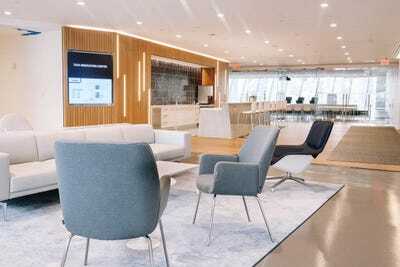 Harrison Jacobs/Business InsiderThe lobby of the Emma and Georgina Bloomberg Center. Guests check-in to the building via the iPads, but the cafe and lobby spaces are open to the public. 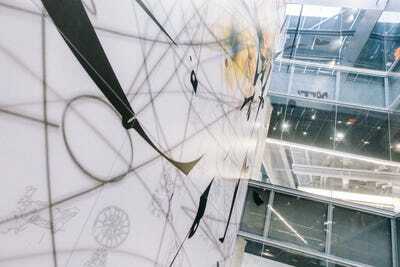 The school’s nods to the tech industry go deeper than the white surfaces. Rather than have separate offices or floors for different departments, Huttenlocher and his team opted to have all the departments mixed together. “We have a very open interactive environment,” he said. As if in a nod to startup culture, faculty offices are in an open-floor plan. The school wants its faculty to be connected to the tech industry, whether working on their own startup, consulting, or advising. “Most of them are not in their office more than a quarter or a third of the time,” Huttenlocher said of faculty. Harrison Jacobs/Business InsiderOne of the many faculty office spaces in the Bloomberg Center. Rather than evaluate faculty solely on their teaching and research, Huttenlocher said faculty are evaluated in a third area – engagement. 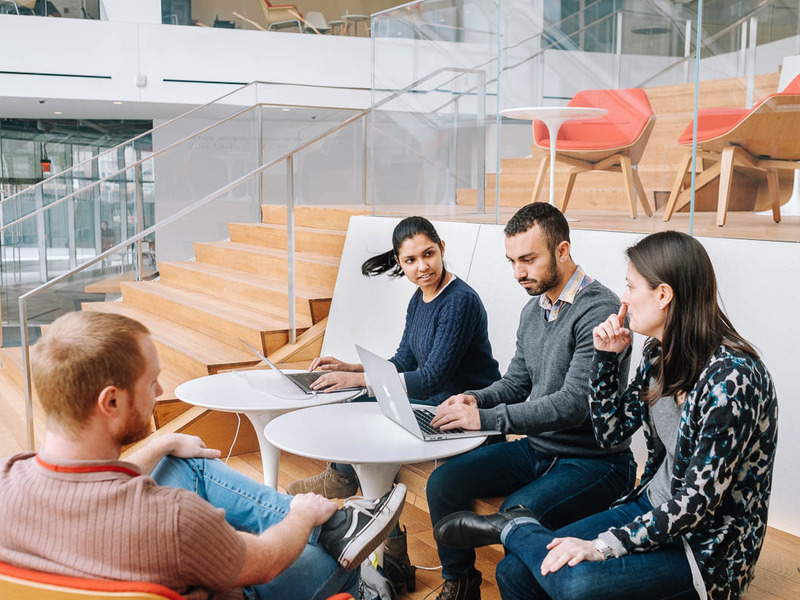 For some, that means developing their own startups or working with nonprofits or commercial ventures. Harrison Jacobs/Business InsiderA key component of the Bloomberg Center design is its ‘art-in-architecture.’ This installation by Matthew Ritchie called ‘Everything that Rises Must Converge’ dominates the four-story atrium. Huttenlocher’s first hire was Deborah Estrin, a leading computer scientist in the field of small data who has won numerous accolades over her decades-long career. Estrin designed the school’s two-year Health Tech program, introduced in 2015, which combines study in computer science, information science, and health systems to find new ways to apply technology to healthcare. Harrison Jacobs/Business InsiderSeveral of the building’s meeting rooms have been designed as site-specific art installations. This one, by artist Matthew Day Jackson and called ‘Ordinary Objects of Extraordinary Beauty,’ is made of 90 objects. 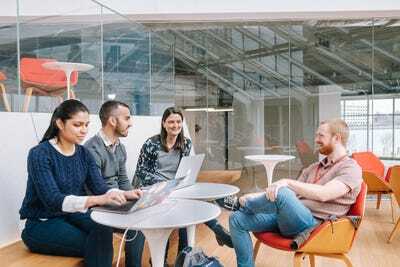 Sen, who graduated last spring, is now the head of product at Datalogue, a Cornell student-started company that uses artificial intelligence to automate data preparation for Fortune 1000 companies. The company raised $US1.5 million in seed funding last February. 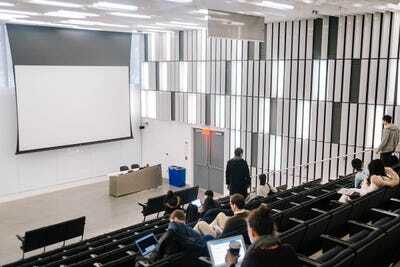 One of the school’s main goals is to build a bridge between high-tech industries and academia. 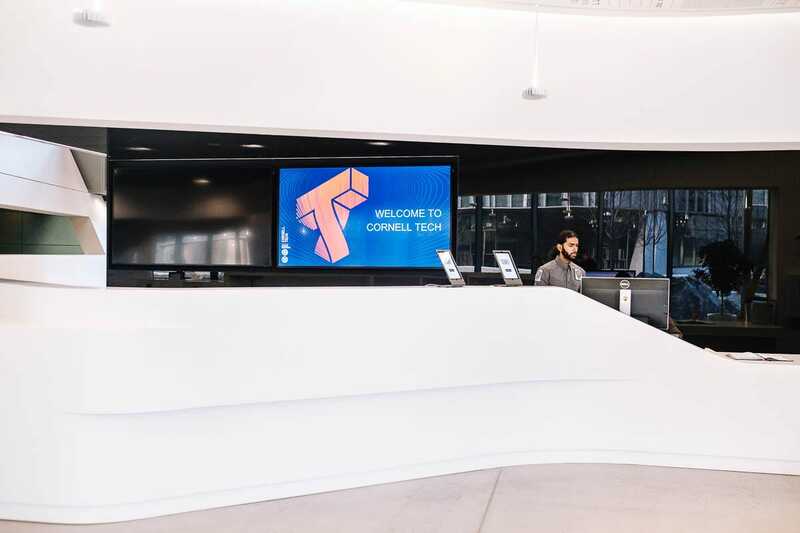 The Tata Innovation Center “is intended to be the embodiment of that mission,” Kate Bicknell, a senior vice president at Forest City New York, the developer of the building, told Business Insider. Harrison Jacobs/Business InsiderA view of the Tata Innovation Center, developed by Forest City New York with a $US50 million investment from Tata Consultancy Services. It was previously called The Bridge. The Tata Innovation Center is divided between Cornell Tech, a co-working space for early-stage companies, and offices for larger corporations. Housed in the building, Cornell’s Studio program forms the core of all degree programs, from engineering and computer science to business. Harrison Jacobs/Business InsiderThe lobby and ‘grand stair’ of Tata is intended to turn into amphitheater-style seating for speaker events. The Studio curriculum is the foundation of the school’s philosophy: education should be experiential, hands-on, and full of trial and error. 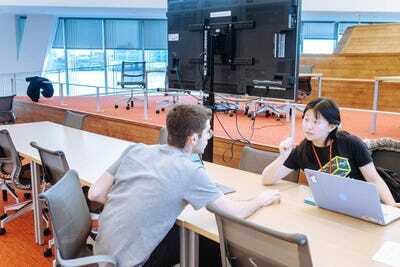 In the fall, students take a class called Product Studio, where Cornell brings in around 80 or 90 organisations like Citi, Verizon, and investment firm TwoSigma who come up with “product challenges” for multidisciplinary student teams to complete. 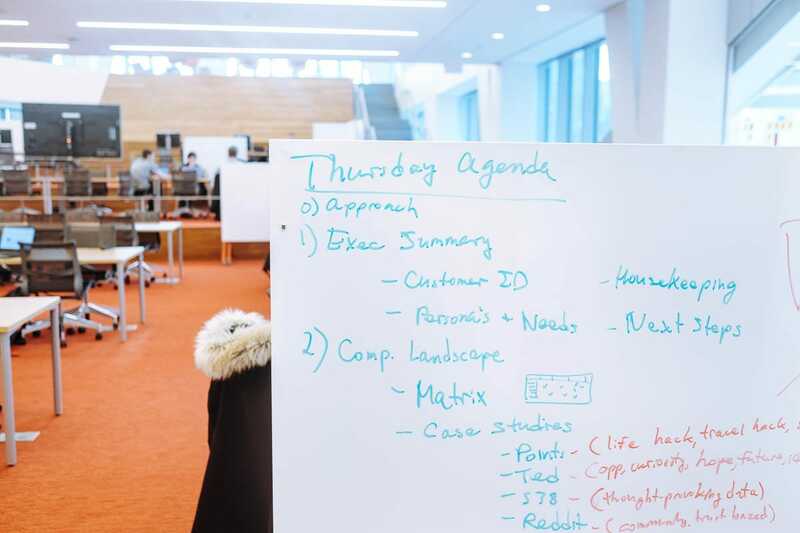 In some ways, it’s preparation for the spring semester’s Startup Studio, a mandatory class in which students collaborate to produce a business plan and a product within 14 weeks. “Someone with a business background can be a really effective addition to a team of engineers thinking about how to create a computer vision or machine learning product,” David Tisch, the head of Startup Studio and a major Silicon Alley venture capitalist, told Business Insider. 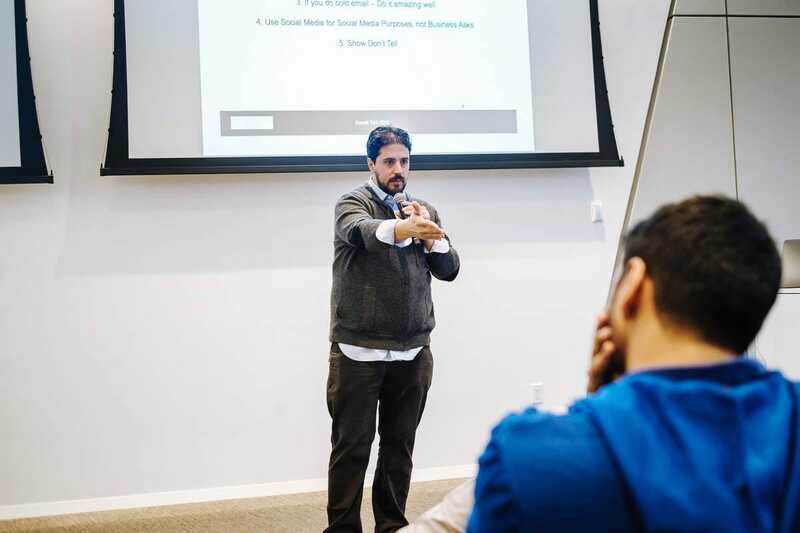 For many students, the Product Studio class was their primary reason for entering the program, a place where they could launch their long-gestating startup idea in a supported environment. For others, it’s a way to learn the entrepreneurial process. 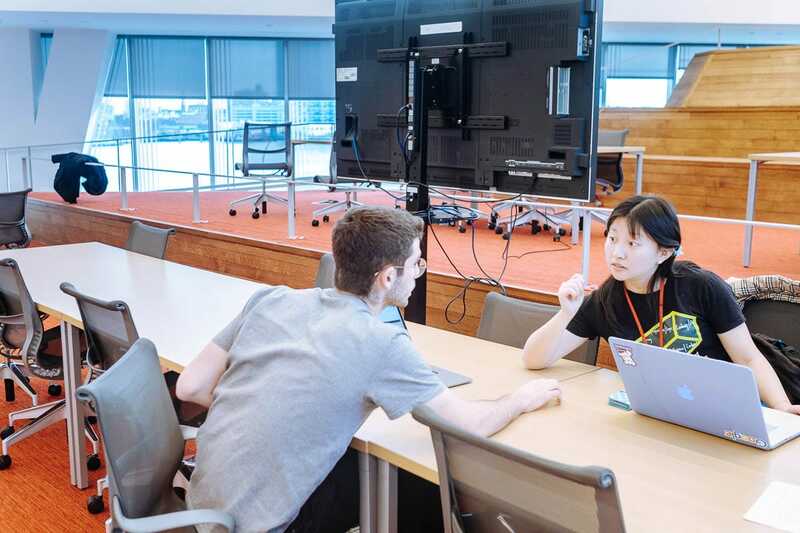 Harrison Jacobs/Business InsiderCornell Tech grad students Noshin Nisa (L), Kiyan Rajabi, Carolina Peisch, and John Quinn, talk before their Startup Studio class in the Tata Innovation Center. Tisch, Huttenlocher, and Pass, the former Twitter CTO, built the concept from scratch after experimenting in Cornell Tech’s initial years to fulfil the school’s goal of students turning theoretical knowledge into practice. Like the rest of the school, the Studio curriculum has been iterated. Each year, according to Tisch, the curriculum of the Studio changes about 20%, meaning by now, it’s fourth year, it’s mostly a new curriculum. For example, Cornell changed how it sourced projects for its Product Studio because companies were submitting ideas that were too narrow. The school now sources “product challenges” that are broad enough that a multidisciplinary team can tackle it, not just a software engineer. “Product challenges” now tend to start with an open-ended question. A 2016 challenge from Weight Watchers asked students: How might we tackle teenage weight loss without teens feeling like they are on a program? 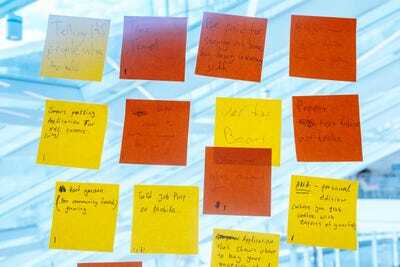 Harrison Jacobs/Business InsiderBusiness ideas written on post-it notes are displayed on the walls of the studio area in Tata. Ideas are grouped by industry or concept. Tisch has a reputation among students for being blunt, brutal, and brilliant. The kind of professor who doesn’t suffer fools lightly. Harrison Jacobs/Business InsiderDavid Tisch, a major Silicon Alley venture capitalist, and the CEO of angel fund Box Group, lectures during a Startup Studio class. 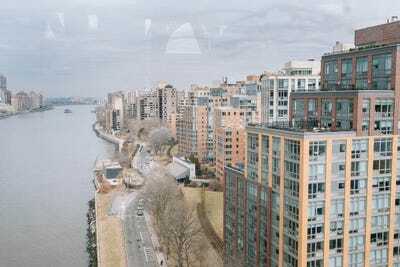 My offence, I believe, was asking what he did prior to Cornell Tech. The lesson for students: When you only have a few minutes to meet an important person, don’t waste time asking something you could have researched beforehand. Harrison Jacobs/Business InsiderA whiteboard in the studio area where student-teams work on their business ideas. “Whenever someone has a question they can’t answer, someone will just say, ‘the blockchain can fix it,'” Quinn said. Harrison Jacobs/Business InsiderStudent teams work on their business and product ideas during Studio work time in the Tata Innovation Center. Examples include ThreadLearning, a data platform for autism students that raised $US300,000 last May, and SpeechUp, a software that gamifies speech therapy to make it more accessible. “It’s awesome when you see students coming in with a passion around a mission that they can combine with an actual product,” Tisch said. The class’s final exam is unique: pitch your company to the class and show off the product. 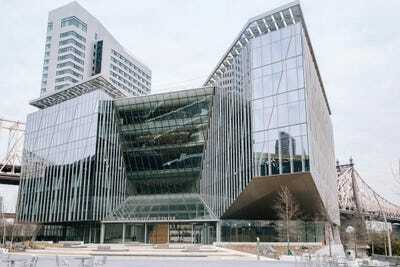 Most business schools, Tisch said, stop at the business plan. Cornell Tech wants its students to build the prototype and put the business into action. Harrison Jacobs/Business InsiderTwo students discuss a product diea during Studio work time in the Tata Innovation Center. “It’s all baked around students learning by doing things and building technology. Then you work on productizing them. That resonated with what I enjoy doing and what I believe in,” said Cheng. Harrison Jacobs/Business InsiderStudents work on a pop-quiz in the Startup Studio class. Instructor David Tisch asked students to compose an email to a potential investor. That money, which has grown from aroun $US40,000 initially to $US100,000 last year, ideally provides enough run time for a nascent startup to pitch VCs and obtain capital within a few months, said Tisch. 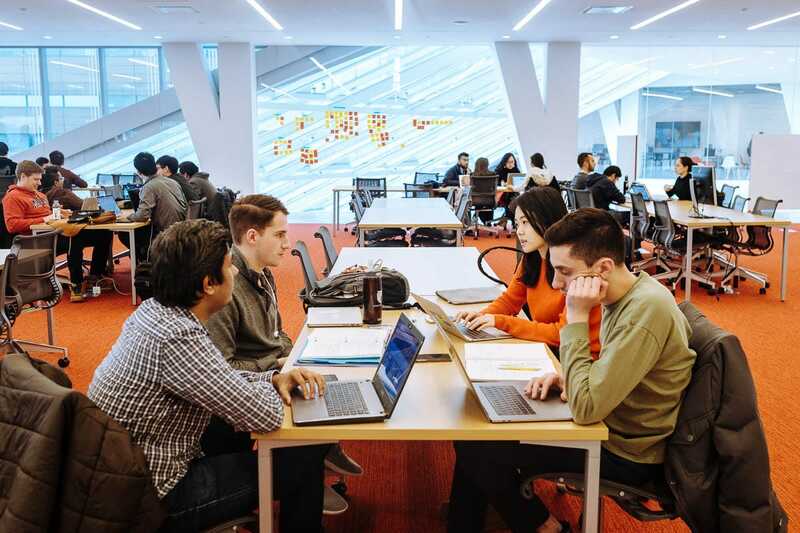 One of the most successful Cornell Tech companies to date is Uru Video, a software using computer vision and machine learning to place ads in the background of existing videos. One of the May 2016 winners, Uru secured $US800,000 in pre-seed last January. Meanwhile, SpeechUp, a 2017 winner, has chosen to bootstrap for the time being and will begin seeking funding at the end of March, according to Cheng, who graduated in 2017 along with co-founders Serota and Steven Chen. The company’s other co-founder, Eliza Bruce, completed a master’s degree at the Parson’s School of Design over the same time. But Cheng said he isn’t worried. 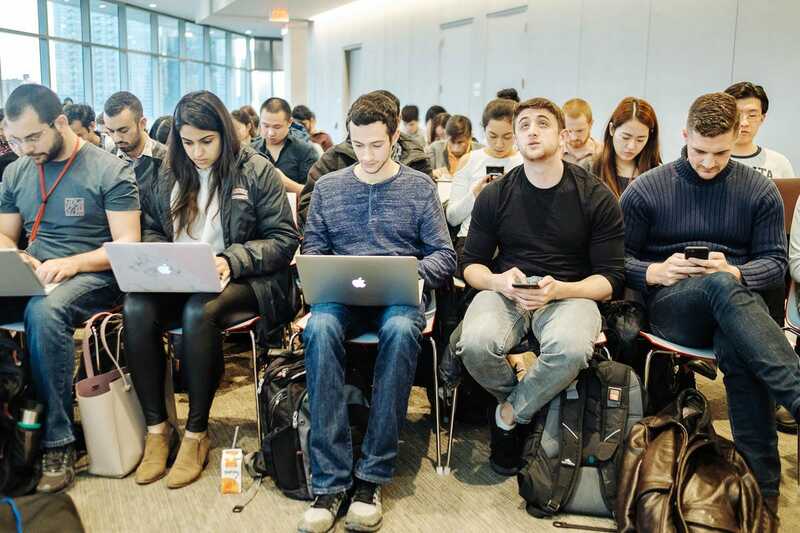 Harrison Jacobs/Business InsiderStudents file in for a class in a lecture hall in the Bloomberg Center. “The hope is to bring the right investors around the table, meet the students early, see their growth, and get involved,” said Tisch. The Tata Innovation Center was designed to further the school’s engagement with industry. 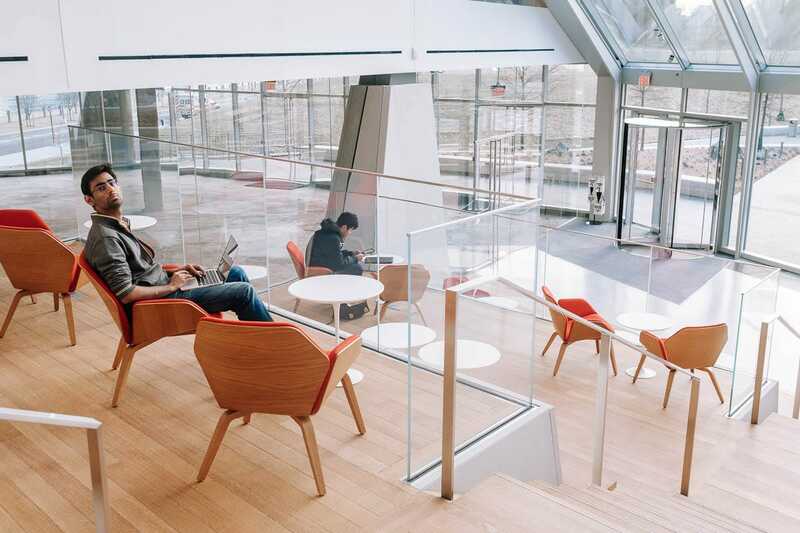 While the bottom floors are for Cornell, each floor above it progressively adds companies and investors that want to be engaged with the school. Harrison Jacobs/Business InsiderA view of the Tata Innovation Center. 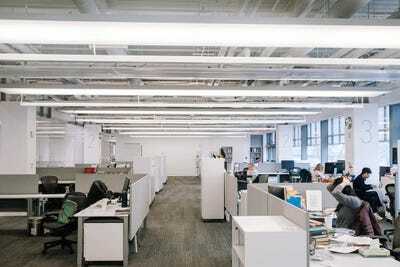 “It’s not just about office space. It’s about what the opportunity of being here means that you couldn’t get anywhere else,” said Bicknell. Harrison Jacobs/Business InsiderThe common space on the fifth floor of the Tata Innovation Center, outfitted with ‘phone nooks,’ ‘collaboration booths,’ and a coffee bar. The school isn’t finished developing. 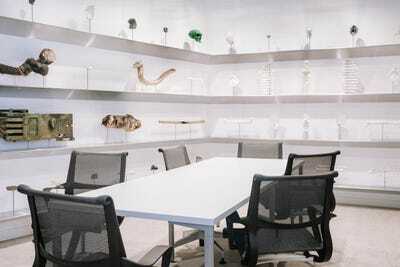 The Verizon Executive Education Center will have space for large classes, academic conferences, and workshops. 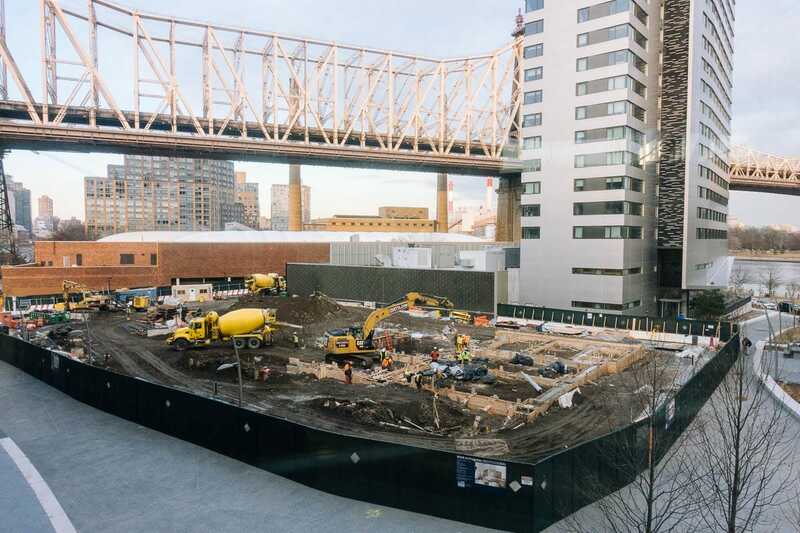 It will be connected by a large hall to the adjacent Graduate Roosevelt Island Hotel, a 195-room hotel. Both are due to be completed next year. Harrison Jacobs/Business InsiderA view of construction on the Verizon Executive Education Center. Behind the construction site is The House, an apartment building for Cornell faculty, staff, and students. 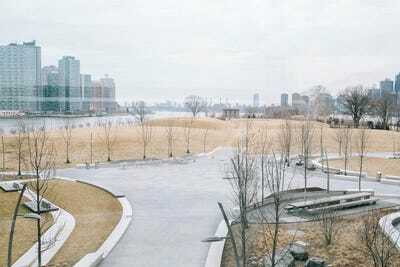 Harrison Jacobs/Business InsiderA view of the open spaces on the Cornell Tech campus, which will be developed into buildings in the future. As of this year, the school has launched 40 companies that have raised around $US32 million and are currently employing more than 170 people.In October, a Cornell Tech-launched company was acquired for the first time. 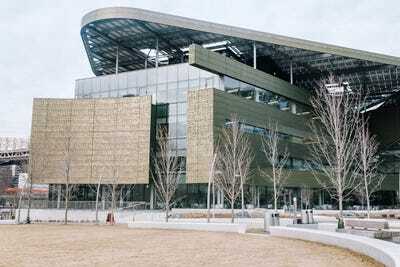 “Cornell Tech is a startup and startups take a while to figure themselves out,” Tisch said.